Which countries are affected by Russia's food embargo? In 2013,the EUaccounted for31.5 percent ofimports of meatandmeat subproducts toRussia, 42.6 per cent of dairy products, 32.4 percent ofimportedvegetables, and 23.7 percent ofimportedfruit and nuts. 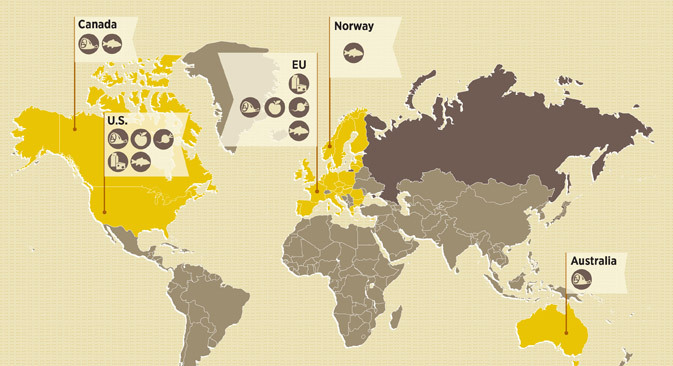 Norway providedalmost40 percent of Russia's fishand seafood products. The U.S., Canada and Australiahad a small share of importsof meat products (10 percent for allthree countries), fish and seafood products (7 percent) andfruit and nuts (4 percent for U.S.), according to dataof the FederalCustoms Servicefor2013.